TV Gets Dumber Every Day. A woman stands at an open door. Woman: I saw your car. What happened? Your front bumper is all dented. Panel 2 of 3. A man is comfortably seated on a reclining chair. Man: The crazy driver ahead of me braked suddenly at a yellow light. The same woman is now exiting the door. Woman: Too bad. Anyway, got to rush to my hair appointment. A wide-screen TV set in the background shows a close-up of a woman. The man is seated on the reclining chair and watching TV. A cat is seated on his lap. 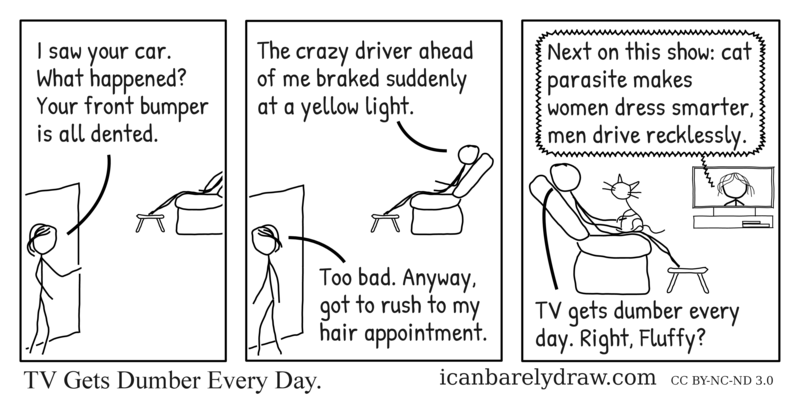 Woman on TV screen: Next on this show: cat parasite makes women dress smarter, men drive recklessly. Man: TV gets dumber every day. Right, Fluffy? Title: TV Gets Dumber Every Day. This is just a cliffhanger.